On Monday, April 29, 7:00 PM, The NCJW/Essex Period.Project and Temple B'nai Abraham present the screening of Period.End of Sentence., at the temple, at 300 E. Northfield Road, Livingston. The film was the 2019 Academy Award-winner of Best Documentary Short Film. The program commences at 7:15 PM. 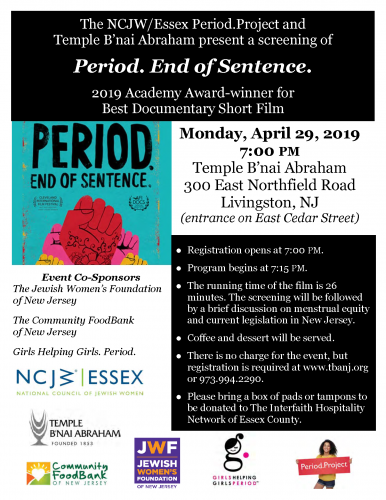 The event co-sponsors are The Jewish Women's Foundation of New Jersey, The Community FoodBank of New Jersey , Girls Helping Girls.Period., TBA Social Action Committee & Sisterhood-The Women’s Connection and NCJW/Essex Period.Project. The running time of the film is 26 minutes. The screening will be followed by a brief discussion on menstrual equity and current legislation in New Jersey.